Like his character, Fonda had been commissioned as a Lt.(j.g.) in the U.S. Navy, serving on a destroyer on the South Pacific before receiving his commission as an officer with Air Combat Intelligence. In fact, both Fonda and his co-star Jack Lemmon (who would receive an Oscar for his role as the wily Ensign Pulver) were U.S. Navy veterans of World War II who ended their service with the same ranks as their respective characters. The United States military had begun implementing the dressed-down khaki shirt and trousers as an official uniform in the mid-1930s due to a request from the U.S. Army’s Panama Canal Department, where servicemen hoped for a comfortable alternative in the oppressive heat of the Panama Canal Zone. In April 1938, a khaki shirt and matching trousers made from 8.2 oz. cotton twill were authorized for duty, per olive-drab.com. Modifications to the Army’s “Class C” khaki uniform continued to be made over the course of World War II, including the introduction of a convertible shirt collar (to be worn with or without tie) as well as the conversion to lighter weight 6 oz., then 5 oz., cotton fabric by war’s end. The comfortable khaki uniform was adopted by other branches, including the U.S. Marine Corps and the U.S. Navy, who had been borrowing USMC’s khaki uniform elements for USN aviators since 1913. By the time of American entry into WWII, the U.S. Navy had authorized the khaki shirt and trousers as an approved working uniform on all ships and submarines. 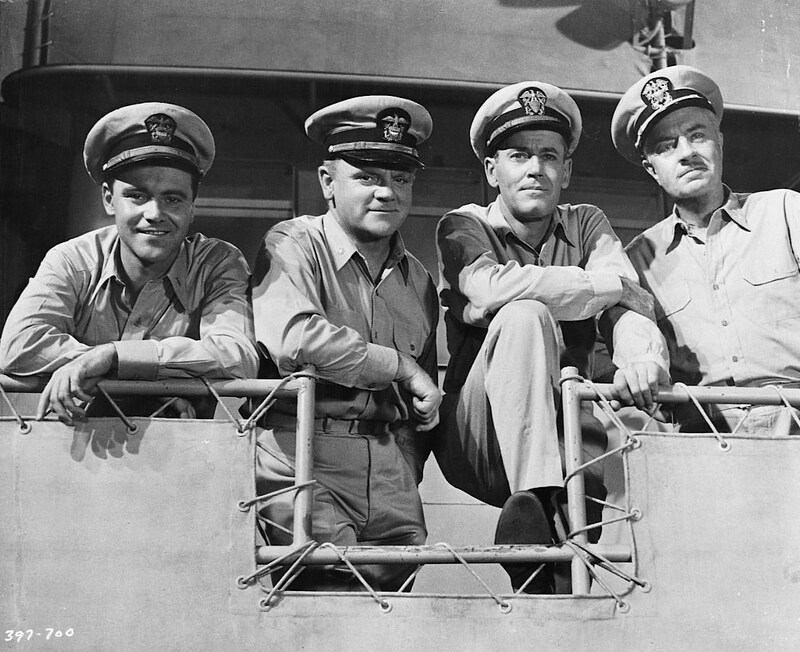 Jack Lemmon, James Cagney, Henry Fonda, and William Powell in Mister Roberts (1955). Each of theri characters here sports the tie-less service khaki uniform authorized by the U.S. Navy during World War II. As USS Reluctant is stationed in the South Pacific, Lt.(j.g.) Roberts is never seen in anything other than the khaki lightweight cotton twill shirt, even when his shipmates dress down in denim work shirts and dungarees. Roberts’ shirt has two patch pockets on the chest with mitred-corner flaps that close with a single button. The shirt has a front placket and single-button cuffs. As authorized by the uniform code, Roberts wears his rank insignia on both leaves of the shirt’s point collar. The insignia for Roberts’ rank of lieutenant (junior grade) is a single silver bar, positioned vertically, similar to the equivalent O-2 grade of first lieutenant in the U.S. Army, U.S. Air Force, and U.S. Marine Corps. Roberts wears flat front trousers ostensibly made from the same khaki cotton twill as the shirt. The trousers have belt loops, straight side pockets, jetted back pockets, and wide-legged plain-hemmed bottoms. The trousers are worn with a matching web belt made from khaki cotton cloth with a plain gold-anodized brass slider buckle. Current regulations call for a 1¼”-wide belt for male officers, worn with the clip to the left of the buckle, and it’s likely that this was the same size belt worn by Roberts and his Reluctant shipmates. LCdr. Morton (James Cagney) has little patience for his popular cargo chief. For more rigorous workdays, Mister Roberts swaps out his more formal officer’s combination cap with a navy blue utility cap, styled like a baseball cap with a long brim. A smaller gold version of the eagle, shield, and anchors badge is pinned to the center of the crown, just above the brim. I know that Navy service members of the era were authorized to wear utility caps in olive drab (OD-7) herringbone twill cotton to match their utility uniforms, but I’m not sure if this blue cap – which was definitely a standard by the time of the Vietnam War in the ’60s and ’70s – was seen during World War II. When the crew is mustered to the deck in response to Roberts throwing LCdr. Morton’s prized tree overboard, Roberts wears an olive drab M1 helmet and a blue Kapok life vest with its distinctive neck floatation support. U.S. military tradition encourages only members of the naval aviation community to wear brown service shoes with their service khaki uniforms. Thus, cargo chief Lt.(j.g.) Roberts wears a pair of classic black leather plain-toe oxfords with black socks. A few words with Doc (William Powell). Roberts wears a plain steel wristwatch with a round white dial on a dark leather strap. It may be one of the utilitarian models produced by Elgin and Hamilton for U.S. servicemen to wear during World War II. 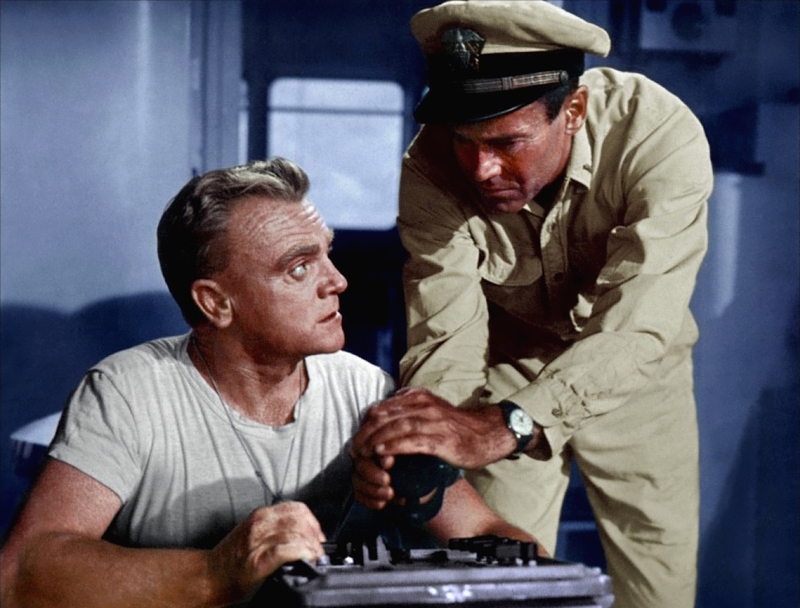 When the ship is docked for “liberty” on an island in the South Pacific, Roberts is assigned to remain on ship. As officer on duty, he wears a .45 in leather holster strapped to the right side of a thick khaki webbed gun belt. The weapon is never drawn, but it’s likely the standard M1911A1 semi-automatic pistol fielded by all U.S. military branches as an issued sidearm during World War II and through most of the 20th century. 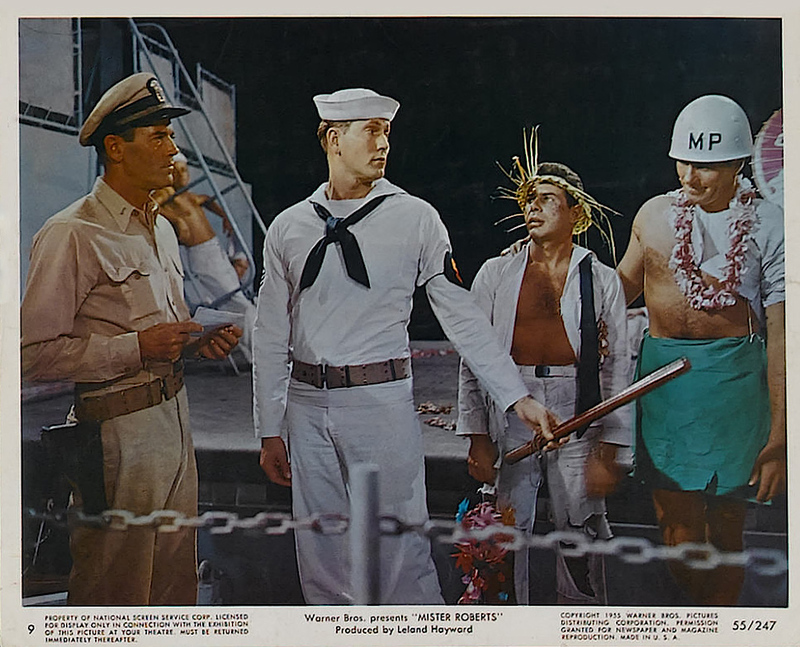 Lobby card from Mister Roberts (1955), featuring Henry Fonda’s Lt.(j.g.) Doug Roberts armed with a .45. 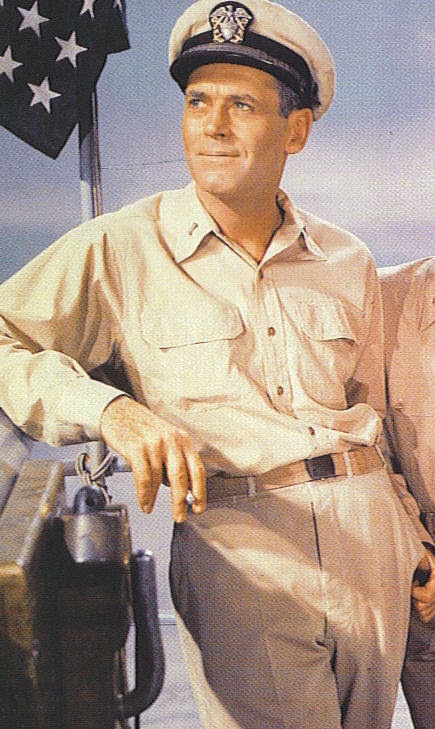 Modern service khaki uniform regulations call for award ribbons to be worn above the left pocket on the shirt, though the only award that Roberts wears on his shirt is the one-of-a-kind “Order of the Palm”, created by the crew of the USS Reluctant as a parting gift to the popular officer. Mister Roberts proudly accepts his one-of-a-kind recognition. The “Order of the Palm” itself consists of a large gold palm tree device suspended from a teal ribbon with a single red diagonal “uphill” stripe, flanked by a thinner white stripe on each side. Doc, let’s make some Scotch… as naval officers, we’re supposed to be resourceful. Luckily for the crew of the USS Reluctant, there may be no better man to have around in a crisis of booze than William Powell. The boys add iodine for taste – and what taste it is! – and “age it” with hair tonic. Do not try this at home. 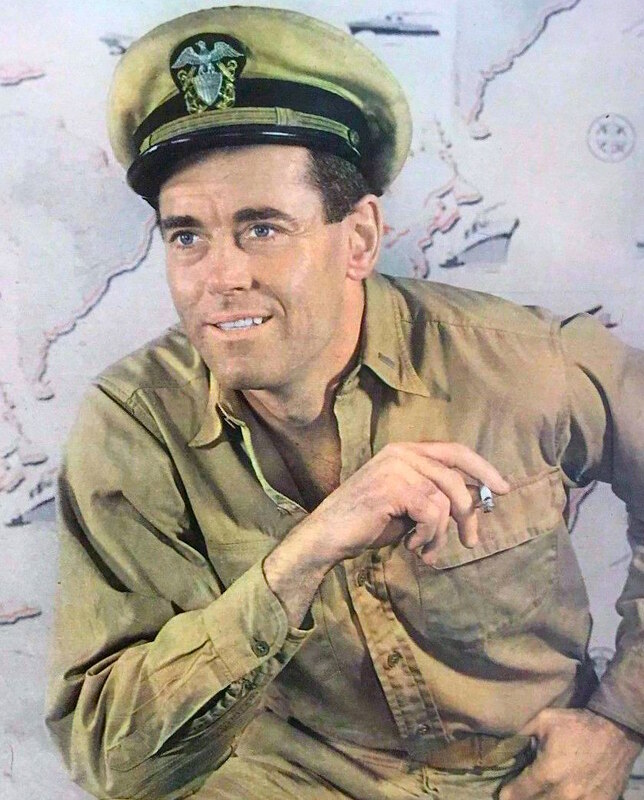 Henry Fonda in Doug Roberts’ service khaki U.S. Navy uniform, dressed for the Broadway production of Mister Roberts prior to the 1955 film release. Lt.(j.g.) Doug Roberts spent most of his days on the warm deck of USS Reluctant in the standard service khaki uniform that was popularized by U.S. Navy officers during World War II. I just happen to believe in this thing, and I wanna feel I’m good enough to be in it!